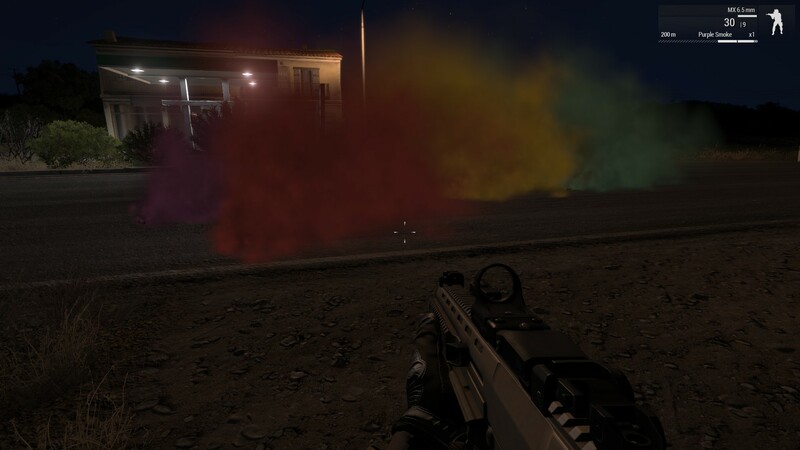 I like your new lighting update, the scenery now looks better, now when it rains, everything looks better, but at when comes to sunny weather, by default settings, game colors, for me at least, look more cartoon-ish and bright color clothings/uniforms glows too much. When in scenery you have combination of green grass, orange/red ground and clear blue sky, game is now looking little bit more cartoon-ish (this is more pronounced on all standard settings) Just try to lower the strong colors and uniforms should not glow too much. As for that water shaders and reflection, I LOVE IT !!! But Nato uniform is now too bright, this is clear sky 04:45 time. Ingame they can be more easier seen. On Stratis, go to this position (Near Agia Marina) and move by following the red arrow. On my side, rocks change their shape very quickly. One small suggestion while you're at improving the visual experience. Can we have a small fix for flickering of the dynamic lights. What I mean is if you have your dynamic lights at let's say normal, you have a limited hard number of light sources in the scene. So when you fire a gun, somewhere in front of you one light source will turn off for a second creating sort of flickering. Nothing game-breaking of course, but would I nice addition to the visual experience. Not sure what solution would go nice with this. Maybe just don't count muzzle flashes as a light source, but that creates a question what to do if there's 20 guns firing. On the other hand that's not really a common situation where you see 20 guns firing in front of you. And it's for a short time anyway. You are telling me , i will have to update every single rvmat to adapt to the new contrast? meaning all the custom addons? Believe me, it's not necessary on 90% of content. Most stuff looks far better without making any changes at all. I was asking about a very specific texture/material setup I had on a model, where virtually all diffuse colour information was in the lower 5% of the brightness scale and 0% of saturation, and reflections were fairly low. So it was all out of range of the new colour grading curves. Other models I have that are black, don't look so "off" because there aren't other similar materials on the model, and they have more fresnel reflection in the .rvmat than my EOTech did anyway (don't want lots of fresnel on that because it's mostly plastic). 2. 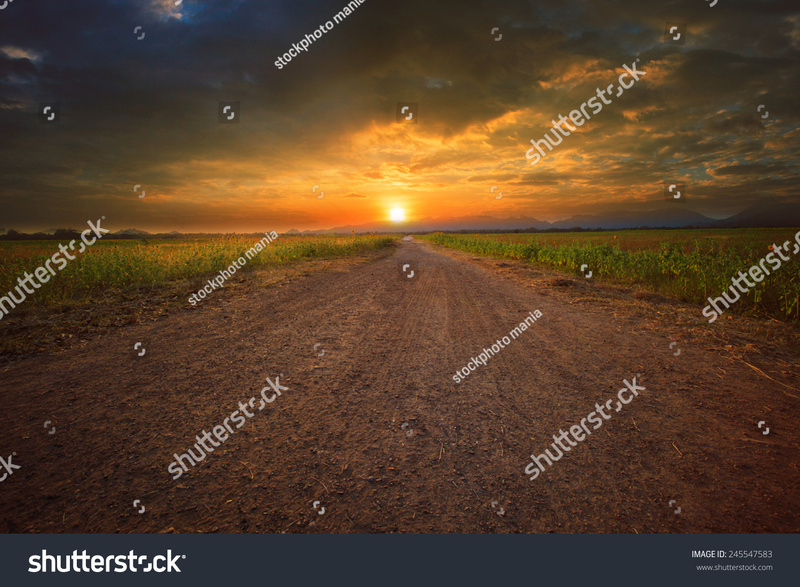 The new road texture doesn't reflect sunlight. It seems to have no specularity at all. As you can see, the sea is properly reflecting the sun, can't say the same for the road though. 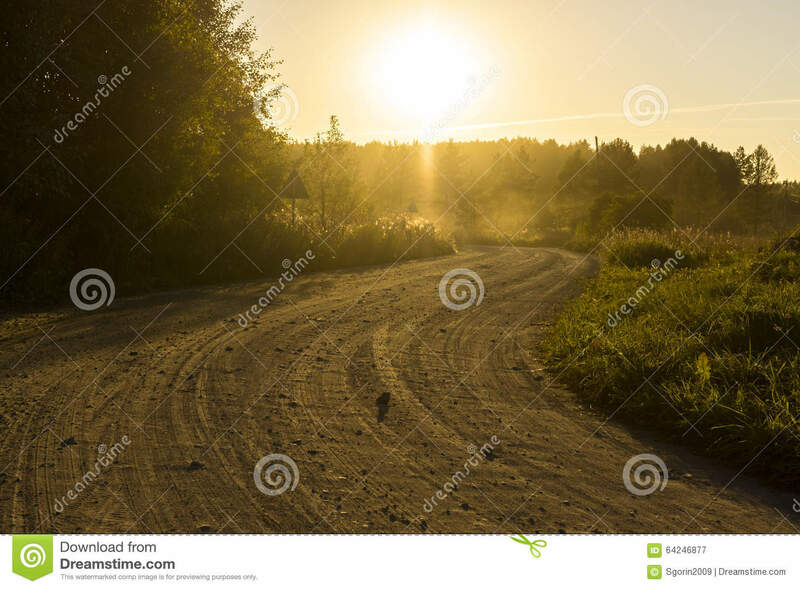 the bigger boulders / stones on the road surface however would reflect sunlight a bit even when dry. Thanks for confirming and testing! Can a dev chime in and explain if this is the desired behavior or a bug we've discovered? Thank you for your feedback I will checked it what is wrong. Not only rocks, also grass, bushes and trees. I made a ticket a while ago with several positions and it was, so far I remember, assigned. I really hope that's going to improve. The quick lod change really kills the immersion. Finally got the game look good again in my eyes. Took me 20mins to find some right balance. Setting difference between dev and stable is pretty big one for me. I found a bug but don't know if this is fixable, but its very annoying. The objects on terrains disappearing, only ground itself stay, and eventually some trees/houses when you look from behind the buildings corners. It make Fire-fights in cities very hard, sometimes impossible, because you need to show yourself fully to enemy to see him, instead of uncovering head only. Stay behind corner, lean behind it try it on several buildings. i noticed that too on stable branch. i think it might be misconfiguration of recently added occluder-technology. 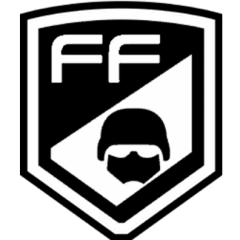 The devs know about that, I created a very detailed ticket a while ago with several positions to reproduce the issue. Everything looks fine so far, the only thing I noticed is that there is a weird animation gltich when you crouch walk to the right with the pistol in hand with ready pos toggled. It looks like it cannot decide wheter it wants to transition to the low ready or the high ready animation - only happens with the pistol though. i believe adding better quality rocks, boulder should be part of any visual update because current quality of rocks and boulders are very out dated. seems like they were done in 2-3 minutes time max. i believe creating a few sets of boulder, rocks, clif faces using photogrametery will add whole lots of visual appeal to the game. 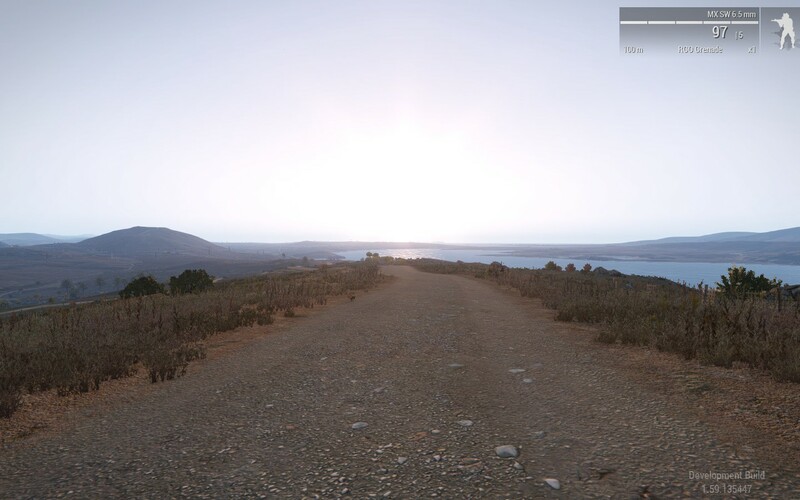 for comparision i have have pasted arma 3 rocks vs vanishing of ethan carter rocks. i believe adding better quality rocks, boulder should be part of any visual update because current quality of rocks and boulders are very out dated. after watching all reference videos and pictures of the update i could find i'll give my little feedback even though i did not run dev-branch myself. + the new clouds and water are gorgeous! And probably higher in poly count into the bargain= FPS issues, they look awesome though. I don't get posts like this. 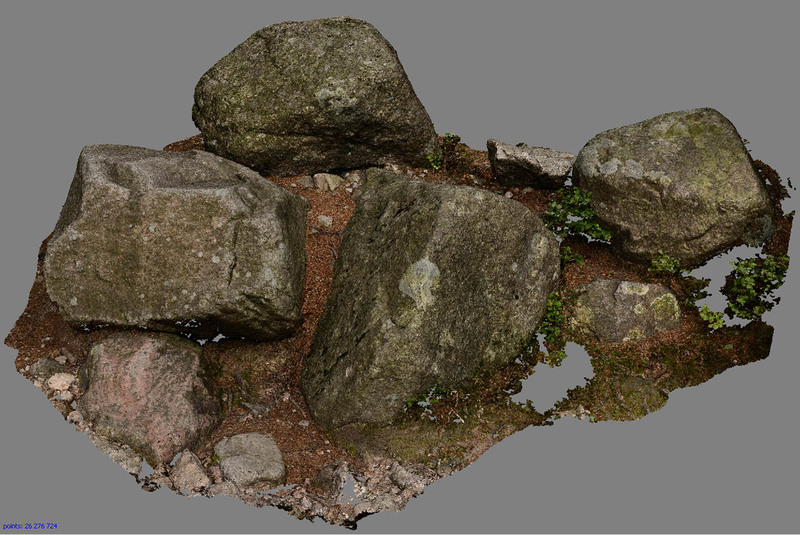 Of all the assets that could be improved visually, you choose rocks? Also, nobody takes the size of Arma's terrains into account when saying "The [things] in [other game] are better than Arma". I've never played that Ethan Carter game, but here's a quote from PC Gamer I found regarding the size of the game world: "there's a definite drawback to how large the map isâ€”it can easily take five-to-ten minutes to cross at full sprint." See how long it takes you to sprint across Altis and then come back here and tell us how the rocks don't look very good. I am having an issue on Dev branch though.After about 30 minutes of play-even on an empty map in the editor, my fps will suddenly drop from 60 to 5. It stays at between 5-6 and feels like the game is about to crash. Items disappear such as backpacks or even my head..And only a restart will fix it.Has happened twice now ,always after about 30 minutes and it happens very suddenly.Everything is perfect before that. I like the new lighting system with the exceptions that are being listed here, like night lighting etc. However, I would like to add that the darkest clouds in the old system look more realistic to me if you want to simulate an incoming storm. 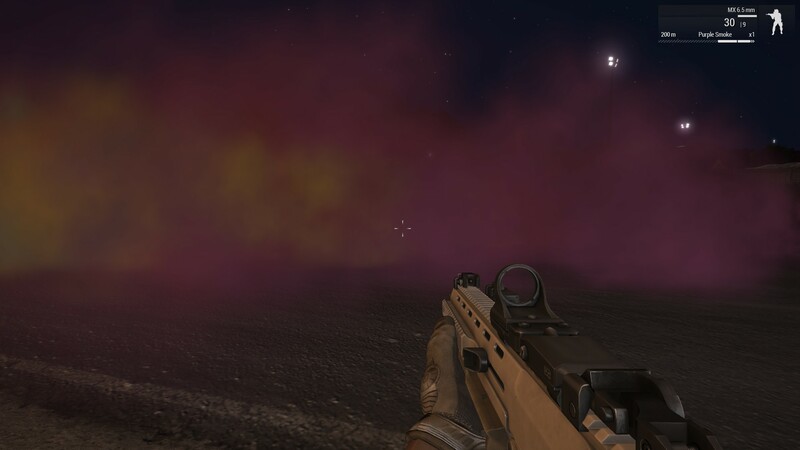 One of the images of the OPREP shows what I mean: the new clouds in the visual update do not give the impression of being ready to downpour water and the overall scene seems too bright for a heavy cloud situation. The image with the previous lighting gives the impression of more menacing clouds. But I guess all boils down to personal preferences. In any case: impressive overhaul! - And when using nightvision underwater during a bright night (moonlit), you can see much farther than you would be able to even during the daytime. I noticed this looking at a past mission of mine where you spawn next to the vanilla sub asset hidden away and I noticed that the moonlight made everything super bright compared to how it used to (which was okay because the NVG's adjusted) but I noticed I could then see the ocean floor that I could not before and it ruins the feeling of open water when in reality the water on that map is only 100m (don't remember the real number so throwing one out there) or so deep. Could you add another water shader or fix the "CalmWater" shader so it is un-affected by fog? 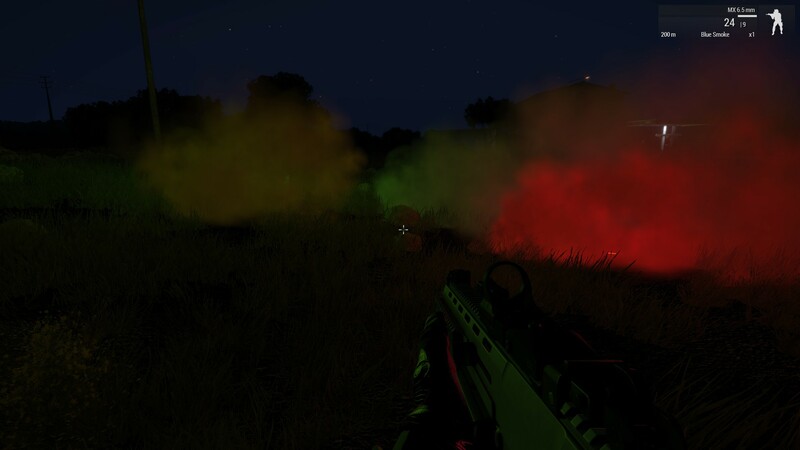 Currently with pond models in Arma3 they look fine, you can modify them till your hearts content using the "CalmWater" shader, except when there is fog. They end up having a strange visual glitch that turns them black and speckly, objects in the water are effectively invisible due to the broken shader. 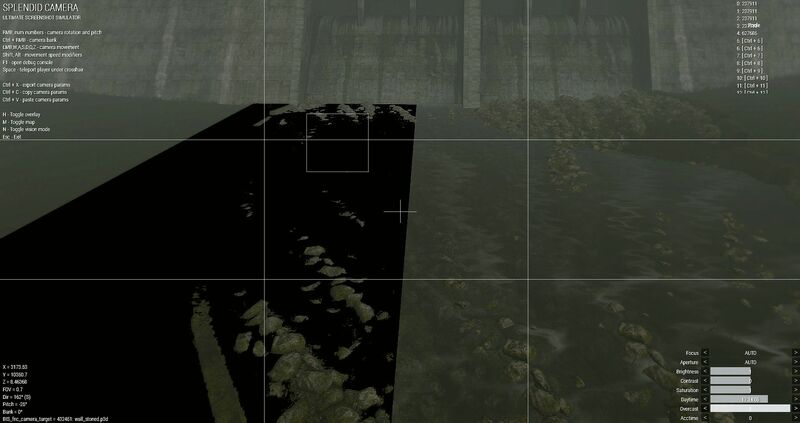 I have tested this using BI's water RVMAT's and my own with various textures/settings, so long as you use CalmWater shader and fog rolls in they go this black way. Using the standard "Water" shader they do not go the black way, but you are limited in the scope you can change them - they look fine from a distance but close up they appear to have a static texture & the sun's reflection also appears as a yellow/orange orb on the water when in the sky it is white - as in reality the sun shining through water appears white when looked at through fog, and the reflection of the sun-sphere also appears white on the water. One of the few things you can really change with the "Water" shader materials is the uvTransform in the RVMAT to change the "motion" of the water surface, you can alter the texturing of the resolution LOD in the model for slightly different effects. 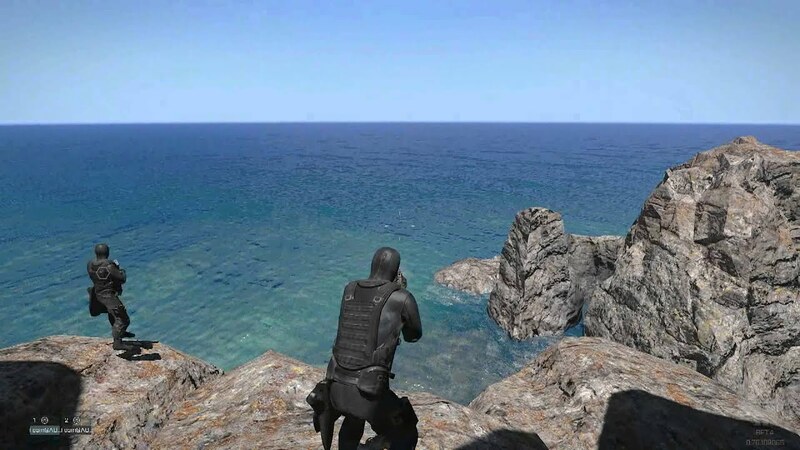 Overall the water effect of the "calmwater" shader is more appropriate for ponds/simulated rivers / slow moving water areas in terrains, so if that was fixed (or another shader specifically for ponds) it would alleviate 1) Huge bug with ponds/fog, 2) Allow us to create more diverse waterscapes within Arma terrains, 2) Add water features into models/assets used in terrains! NB: Exact same model, duplicated and switched out the textures/materials on the second model, Game Settings: Overcast 1.0, Fog 0.8 (Fog effects this shader all the way from 0.1 - 1.0, regardless of Overcast setting), when you set Fog to 0.0 - all the glitching while using the "CalmWater" shader goes away.